Something magical happens when you tie nature and art together, it’s such a spiritual experience that each and every one of us can feel connected to. 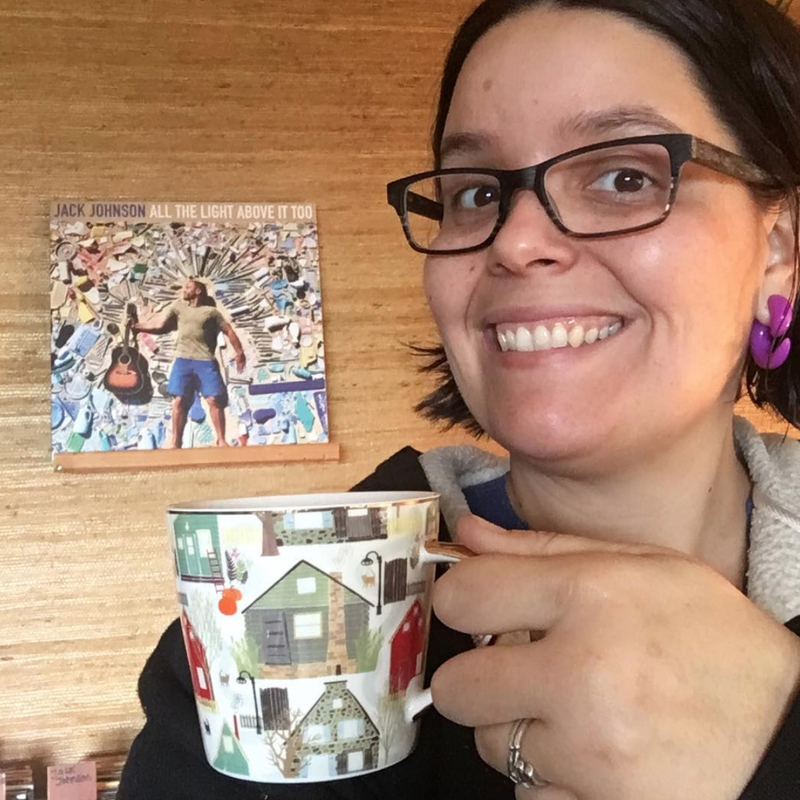 Elspeth McLean is Dig and Hang’s featured artist this week, she lives on an island in the Salish sea in BC, Canada with her husband Adam whom is a guitarist. 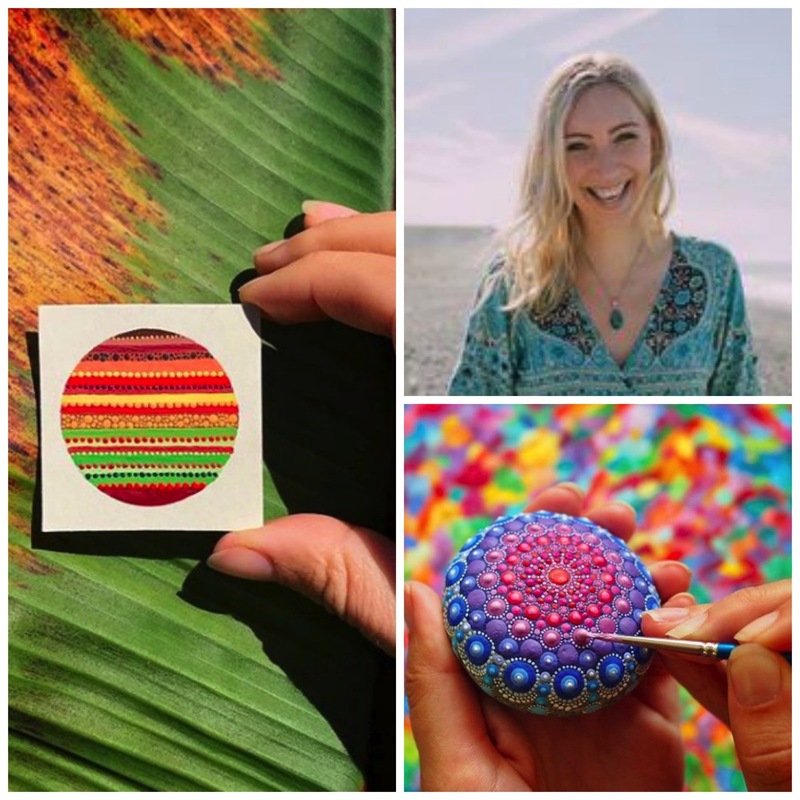 She creates colorful and beautiful works of art that she sells at galleries, shows and online at well, and is currently working on publishing a book that she has worked so passionately on featuring her beautiful mandala stones next to the nature that inspired them. Elspeth currently has a kickstarter campaign for her upcoming self published book if you would check it out and give her some support that would be wonderful money will be raised until October 8th, 2018, you can find her kick starter here. 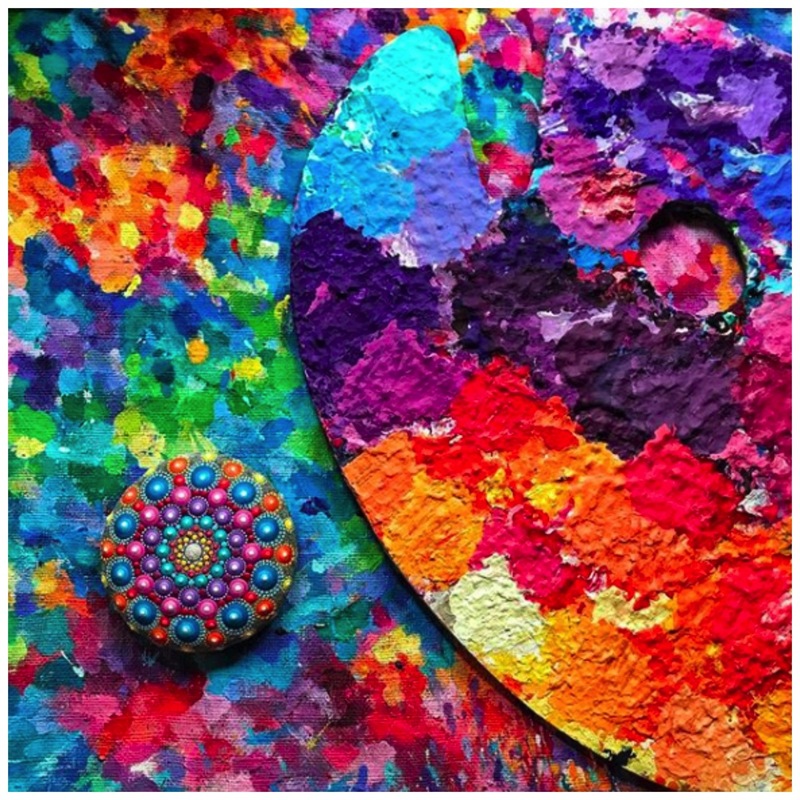 We interviewed Elspeth below so we could get to know the story behind her work, her love for color and her inspiration in home decor, please enjoy and be sure to check out her links below, follow her and give this wonderful artist support. 1. Can you tell us about your work, when did you start creating? 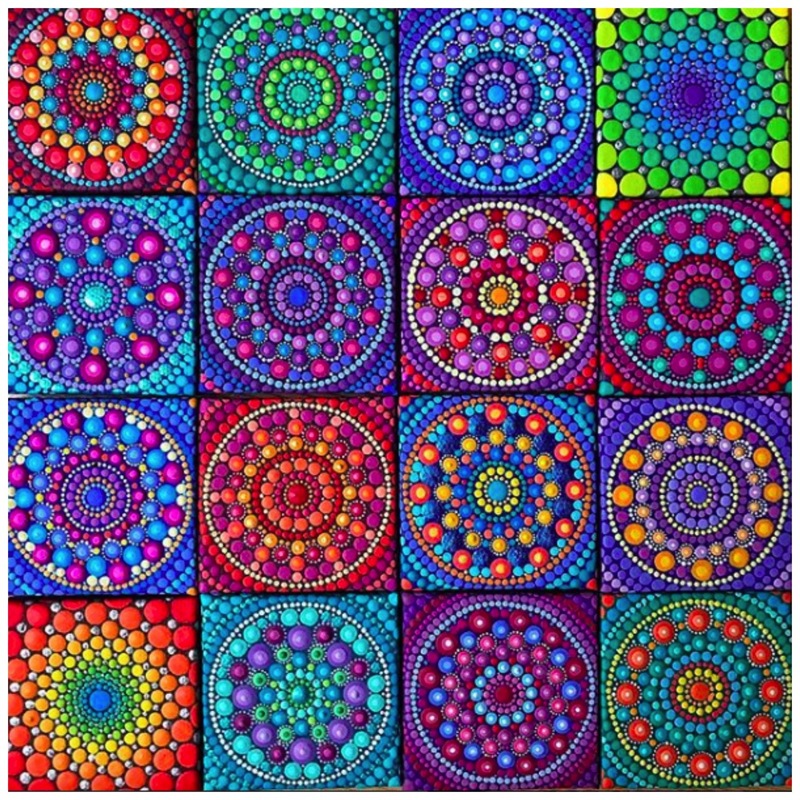 I create vividly colourful, intricate artworks entirely made out of dots. 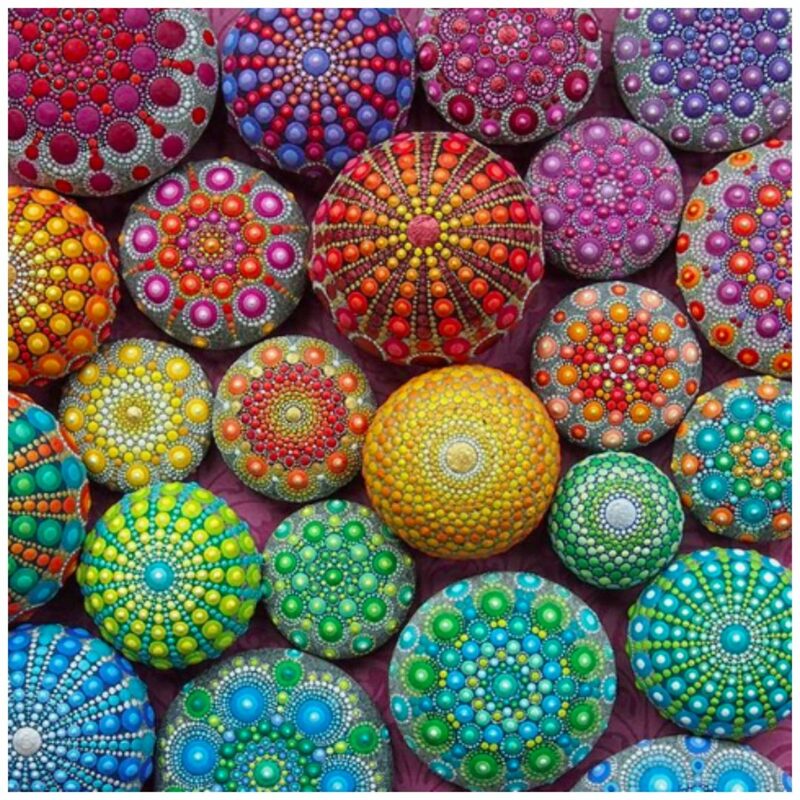 I paint mandalas, dream like naturescapes, and what I’m perhaps most well-known for are my mandala stones. I embarked on my career as an artist in 2006- so I’m into my 14th year! I feel so blessed to be able to make beauty and my mission is to create art that uplifts and inspires people. 2. How would you describe your home decor style? 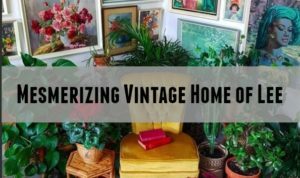 I would describe my home décor style as an eclectic fusion of colour and pattern, or new and old. As my art studio is at home, and I am home a lot, it is important that my environment is a sanctuary- both inviting and inspiring. 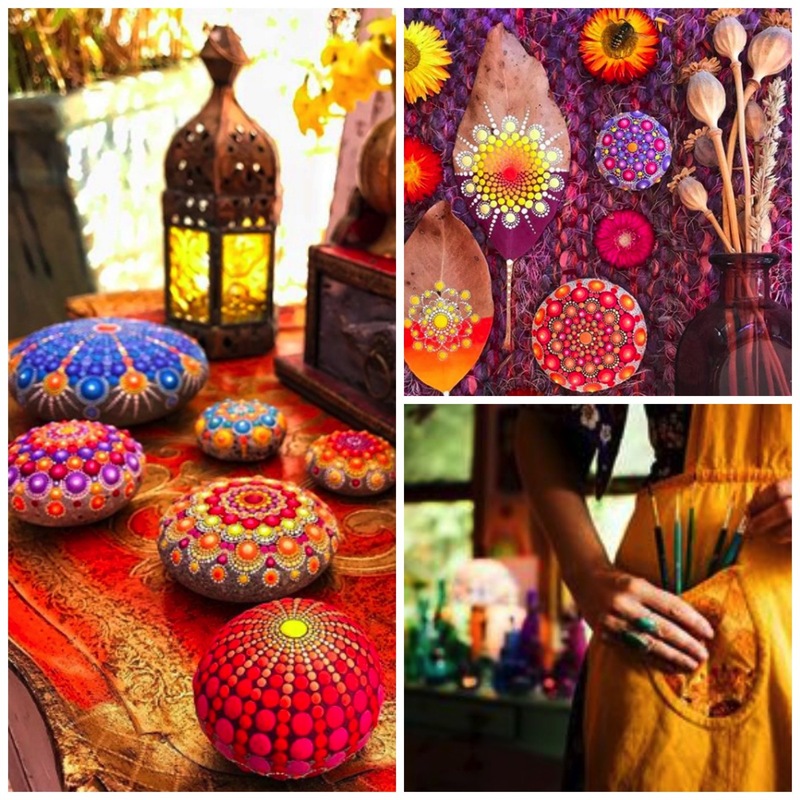 Our home is filled with treasures found on our adventures around the world from Morocco to Mexico to the States. I also love buying and supporting the artwork of other artists. A lot of our furniture and homewares comes from thrift and antique shops too. Every item in our home has a story, memory, or “sparks joy”. 3. What inspires you when you get in a rut? I’ve come to learn and accept that the energy used to create needs time to rest too. I find at times when I’m in a rut, that it is actually both my body and creative self needing a rest! I recognise it as time to “fill my cup”. So I make sure to do things to rejuvenate myself- like getting a massage and taking long baths. For my “creative well” I allow myself time and space to not create. I read more, journal, take walks out in nature, spend time with friends, or perhaps even go on a mini trip. Travel is a big part of my creativity and it is the experiences I have in new places, meeting new people and seeing different things that inspire me. After a short while I ease myself back into creating by starting with painting mandala stones. I never tire of painting these little treasures and I find by focusing on them, I get back into the groove refreshed and refocused. 4. What colors do you enjoy using in your art the most and why? The colours of the rainbow are my favourite to create with! You won’t see much black, browns, muddy or muted colours in my art. I use those very seldom- they’re just not for me! It is warm colours that I find myself returning to again and again- red, orange and yellow. Their warmth is just so radiating and enjoyable to work with. 5. Where do you create most of your work, what is your space like? Most of my work I create in my loft studio in our home. It is an open space area on the third floor of our home overlooking the lounge room. I love how I have this entire space for myself but that it is still open to the rest of the house so I can feel involved in the household. The room is an A-frame and my window has a little alcove that feels like I’m on the bough of a ship. The room is decorated with all my favourite things. I also have a futon that I call my “dream bed” so I can take rests, journal, and cuddle with my cat Lilu. 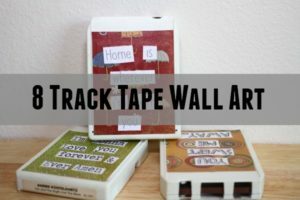 By surrounding myself with photos and trinkets that have sentimental meaning to me, I feel like I have the company of my loved ones, many of whom are far away. My whole studio feels like a sacred altar to the things and people in life that I love. I feel this energy helps draw me into a peaceful state of mind to create. Geninne- Geninne is an amazing artist that is best known for her delightful watercolours of birds. She also makes pottery, silver jewelry, uses hand carved stamps, sews, beads- she can do anything! Her ability to turn her artistic style to different mediums is very inspiring. She has a great eye for aesthetic and home decorating too. 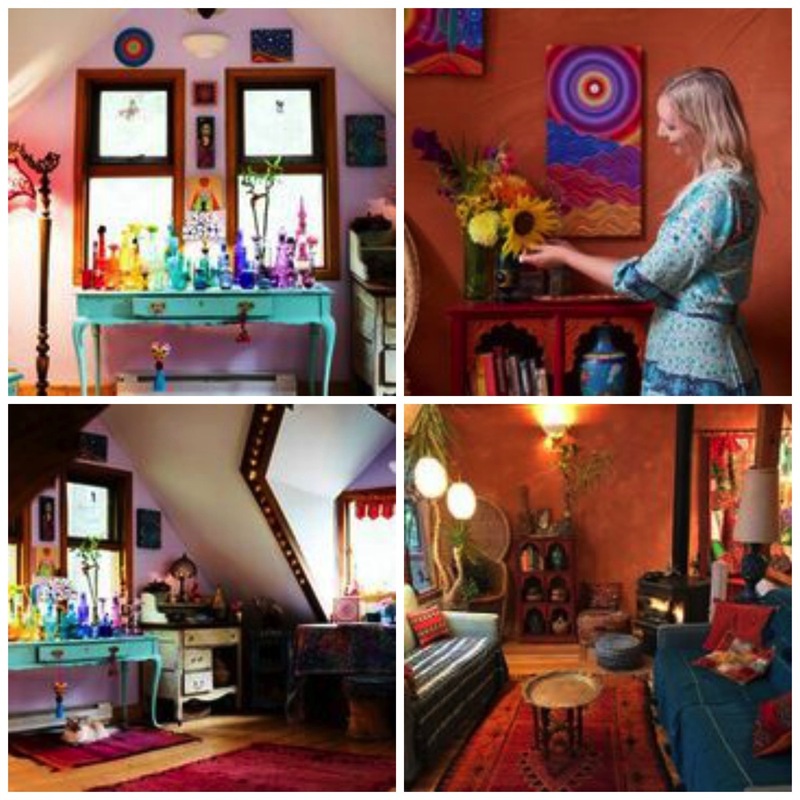 Justina Blakeney of “The Jungalow” – Justina is an absolutely amazing artist, visionary, and business woman. I’ve loved seeing her business blossom and become a worldwide obsession! She has definitely influenced me to include more plants in my home and to mix up my decorating style. Katie Daisy- Katie creates the most wonderful, dreamy, inspiring paintings that she had licensed into paper goods, homeware, and giftware. She has also published two fantastic books that are absolute treasures. Her work is uplifting and nostalgic and enjoyable to look at. 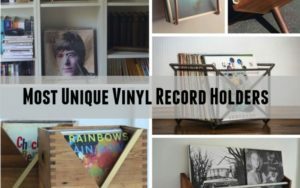 Photo Credit: Amber Briglio Home Decor shots, the last is Elspeth McLean’s. 7. What are your favorite items decorating your home and why? A fresh bunch of flowers brings any room alive! I used to work at a florist, and ever since then, I always try to have fresh flowers. They just make me so happy! I also love coloured glass. When I was little my Dad made stained glass windows and I think that made a big impression on me. Every room in our house either has a stained glass window panel, a glass sun catcher or a collection of glass bottles. I love the way the light filters through them. I have a great collection of rainbow bottles in my studio. I also feel like no room is complete without a small collection of books. My Mum has a whole library at home so being surrounded by books is very comforting. Since going to Morocco last year, my latest decorating obsession is with textiles. Whether it’s a rug, weaving, or cushion or throw- I feel it makes a room very cozy. Then of course I love decorating with my own artwork. Our house is a bit like a revolving art gallery as the paintings and mandala stones come and go.